The Cisco Catalyst 2960-S and 2960 Series are fixed-configuration access switches designed for enterprise, midmarket, and branch office networks to provide lower total cost of ownership. The Cisco Catalyst 2960 and 2960-S Series Switches are the leading Layer 2 edge, providing improved ease of use, highly secure business operations, improved sustainability, and a borderless network experience. 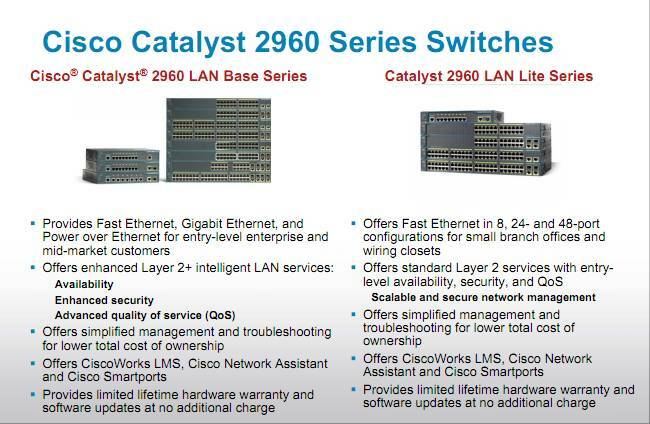 The Catalyst 2960-S Series Switches include new FlexStack switch stacking capability with 1 and 10 Gigabit connectivity, and Power over Ethernet Plus (PoE+) with the Cisco Catalyst 2960 Series Switches offering Fast Ethernet access connectivity and PoE capabilities. 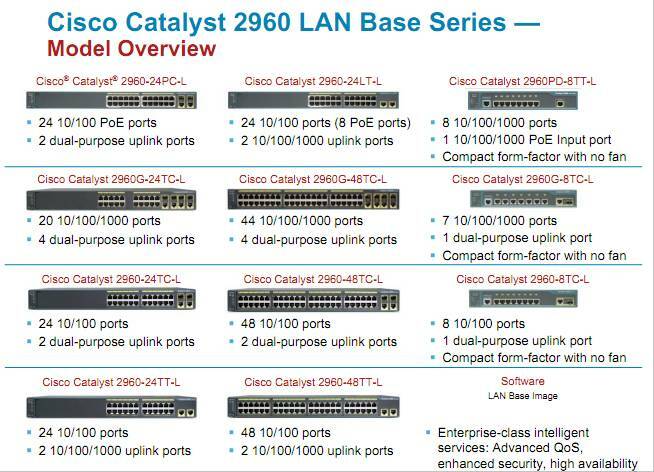 The Cisco Catalyst 2960-S and 2960 Series Switches with LAN Base Software are fixed-configuration, Layer 2 Ethernet switches that support enhanced switching services, IP communications, and wireless networking for small and medium-sized businesses. These switches provide the performance, availability, and manageability that modern office environments demand, as well as the intelligence to support state-of-the-art business applications security services. The Cisco Catalyst 2960-S and 2960 Series Switches with LAN Lite software provide the security and performance that your business applications demand and are scalable to support your continually evolving network environment. By providing these capabilities in your network foundation, you can improve the availability of your critical applications, protect your business information, more easily accommodate expanding services, and optimize your network bandwidth to more effectively deliver information and applications. 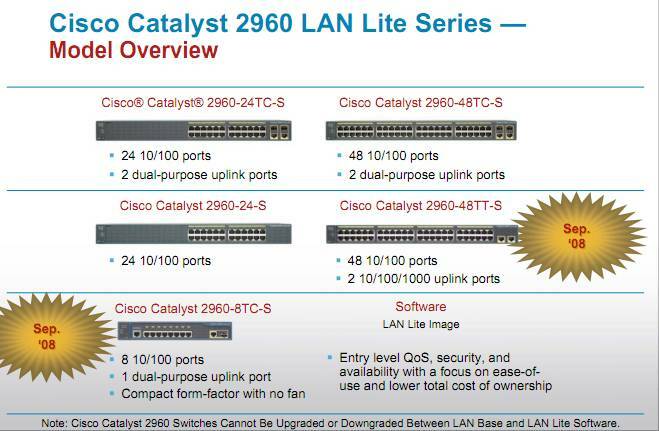 The Cisco Catalyst 2960-S and 2960 Series with LAN Lite software are fixed-configuration, Layer 2 edge switches that provide Fast Ethernet or Gigabit Ethernet connectivity and support essential security, quality of service (QoS), and high availability for growing businesses. These switches deliver the reliability and performance you need to provide a fully scalable managed network environment for your business. More Tutorial: How to Configure a Cisco 2960 Switch/Layer 2 Switch?